The first meeting with Ragnar Lothbrok we have in the series of Vikings we see him in a battle with his brother Rollo. It is the first time he sees Odin take bodies from the battlefield into Valhalla. In the first episode he tells his brother that they always be equals. Then the show starts with introducing his family. Lagertha his wife, Bjorn his son and Gyda his daughter. Bjorn is the age of getting his armring from Earl Haraldson. A big step to manhood. Ragnar hopes to hear after this ceremony that he could sail west. Earl Haraldson decided otherwise he wants to raid the same way they did before. After that decision Ragnar start to recruit his own crew to sail to the west. Floki and Ragnar's agreement with boat builder Floki who made a boat for him. When Ragnar starts to sail west he becomes an outlaw together with his crew. When Ragnar comes back from raiding he can give the Earl everything he had raid except for one to choose from the treasure. Ragnar does this with a greater purpose but when he is send for to go sail again he will do this differently. He attacked a church and there is where he find Athelstan. After he is back from that raid he choose Athelstan for his slave. By the attack on the village where Ragnar lives he badly wounded Ragnar almost to dead. After we see Ragnar disappear in the water it is Athelsthan who saves him out of the water. After a long while staying at Floki’s house he found out Rollo was captured and tortured by the Earl to get information if Ragnar still lives and where he is hiding. Rollo doesn’t tell it. 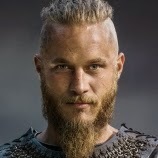 After this news got to Ragnar, Ragnar decided to called out a battle with eachother. It is after this battle when he killed the earl that Ragnar become an earl himself. When he starts to raid again he lose two of his children one unborn child by birth and Gyda due to the plague. Ragnar starts to develop his earl status. He will meet King Ealla during a raid and let Rollo baptise to get political status of willing to cooperate. After the introducing to King Horik in Upsalla and short after that with Jarl Borg who is the enemy of King Horik at that time Ragnar starts his plan. When Ragnar at the end of season 1 meet princes Auslaug Ragnar saw to the beauty and blind for the status she is a princes after all. It is a plan from Jarl Borg to get Ragnar. After Rollo choose to take the side of Jarl Borg because he is not an equal anymore we set of with season 2. A great battle with one thing in mind to let Rollo kill Ragnar starts of quite impressive. Rollo will always choose the side of Ragnar no matter what. But Rollo betray Ragnar. Ragnar need four years to finally decide to forgive Rollo for this. He also need that time to build new boats, find a bigger crew and start to get alliance with King Horik and Jarl Borg. When both King Horik and Jarl Borg are going to betray Ragnar in that season. Ragnar divorce from Lagertha because prince Auslaug is pregnant from Ragnar. Lagertha will take Bjorn with her. Another four years gone by. When Auslaug has already two children and pregnant from the thirth all by Ragnar. Lagertha arrives back with Bjorn to Kattegat. We meet King Eckbert in a bath. Ragnar decided to blood eagle Jarl Borg while his army set in a house of fire. That is the last drop between the friendship between him and King Horik. King Horik hates Ragnar and want to kill the whole family. He ask Floki and Siggy to do the killing for him except the adults. The adults will be killed by his wife, his son and himself. He asked the wrong persons to do that although he didn’t know that until this battle started. The family of King Horik is deceived by a plan from Ragnar and his team. When they kill King Horik. Ragnar is no longer Earl but King Ragnar. That was the finally of season 2. We need to wait what happens next. We know he is going to raid Paris.